Lakeshores always pose an interesting scenario for the landscaper and gardener. In a wild, healthy setting, lakeshores encompass their own little ecosystem and have unique conditions. This is why lakeshores always seem to have some of the most interesting plant (and animal) life. This is also the reason why making special considerations for your lakeshore is important. Building along lakeshores disturbs, even destroys, the natural micro-habitat that exists there. Your lakeshore doesn’t have to revert back to a jungle for it to be a healthy, beautiful lake edge. You can plant along a lakeshore beautifully with great results too. Here’s what to know when planting a lakeshore, and some plant ideas to get you started. Many people live on lakes that are large, and are commonly used for sporting. This can mean a summer-long assault on shores by waves made by large boats and other watercraft. These constant, unnatural waves erode the banks quickly. Rock, usually referred to as rip-rap, is often placed along the shoreline as a way to combat the erosion. This is one, very quick way to slow down the erosion process of the waves, but isn’t ideal. Natural shorelines rarely consist of large, constant, unnatural boulders. Instead, you will see plant life, fallen wood, and other more natural elements along lakeshores. Plant life naturally filters the water that enters the lake. The roots of plants stop erosion and the natural life replaces the soil around the lake naturally as plants die. Wildlife relies on this zone for many things as well. Birds nest and feed here, animals like turtles and frogs use this area to breed and rest, mammals eat on lake edges with plant life, and so on. Rip-rap shorelines are often completely devoid of life. And finally, in areas where lakes freeze over with ice, the rip-rap has to often be repaired each season as ice expands and contracts, pushing rock out of place. Soil and plant material will expand and contract naturally with ice without damage. One alternative to rip-rap that you see often along lakeshores is the lawn that ends with a short seawall of sorts. This is extremely similar to the rip-rap shoreline. It doesn’t encourage healthy filtration of water runoff back into the lake. It’s always devoid of life. And, it can still be easily damaged in areas where lakes freeze over. The best option for lakeshores is to plant them beautifully, as they would occur naturally- with some tending to keep things neat if the wild look doesn’t appeal to you. 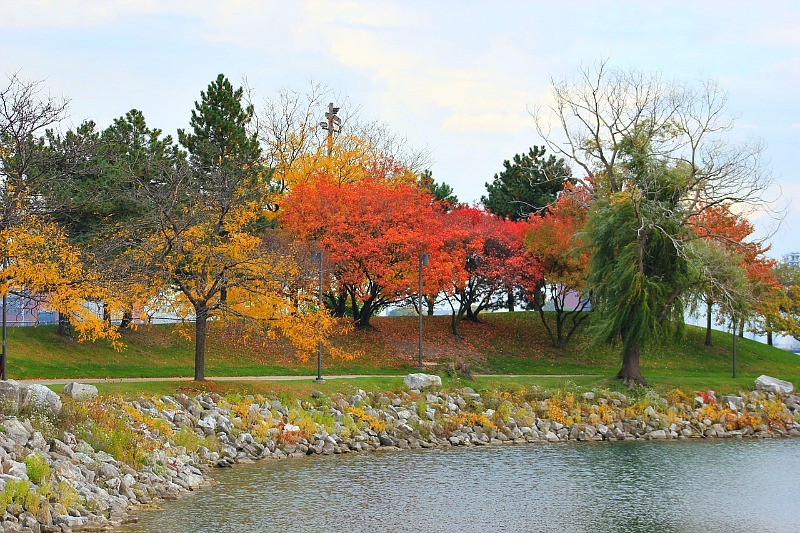 There are many trees, shrubs, and perennials that are especially adapted to living along lakeshores. You may see some of it growing on your property already. Beautiful and fast growing willows, especially romantic weeping willow trees like this amazing Niobe Gold Weeping Willow Tree, are ideal lakeshore trees. They quickly stop erosion along the lakeshore and naturally thrive there. They also often out-compete a lot of other vegetation, so if you’re looking for a very clean lakeshore but want to keep it natural, weeping willows are excellent choices for this job. If you want a sunny lakeshore that’s planted naturally, opt for beautiful native plants. Joe Pye Weed and Swamp Milkweed are two perennials that belong along lakeshores. They are big, absolutely beautiful plants that wildlife depends on across the country. For summer color and interest, Daylilies are hardy and durable for lakeshore settings. For more great information on naturalizing and improving your lakeshore with great landscaping, check out the Minnesota DNR website on shoreline restoration. Read our follow up article Riparian Zones and How to Care For Them.